After Amic Email Backup starts up, you can see its clean backup interface. There are 9 Email clients in the left frame. Choose your client and then you can see the items that you can backup. 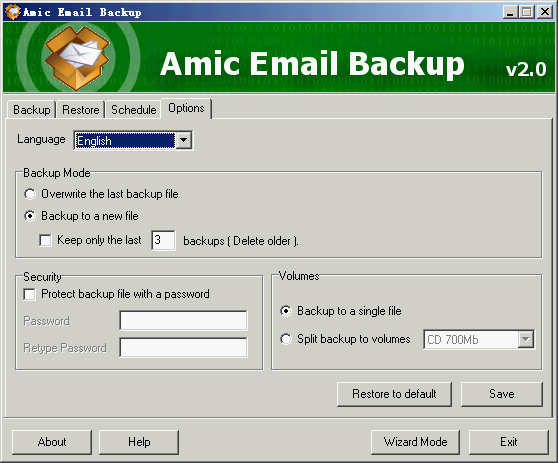 Choose what you want to backup and set the backup file's name, and click "Create Backup!" to create an archive file. That's very easy. There are 4 tabs and the second is "Restore". The "restore" window is similar to the "backup" but the function is different. Choose a backup file in the left frame (the file name is *.ebk) and in the right two frames you can see the items in the backup file. Choose all the items is recommended. In the "Restore Location" area, there are 2 options. 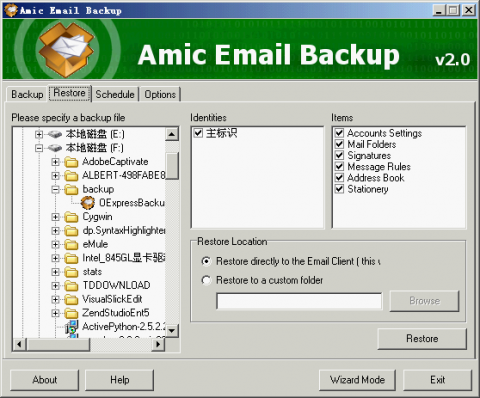 Most of time you should use the default "Restore directly to the Email Client". However, if you don't want to overwrite your current settings, you can choose a custom folder and use the client to import it. After that, click "Restore" button to start the restoring process. 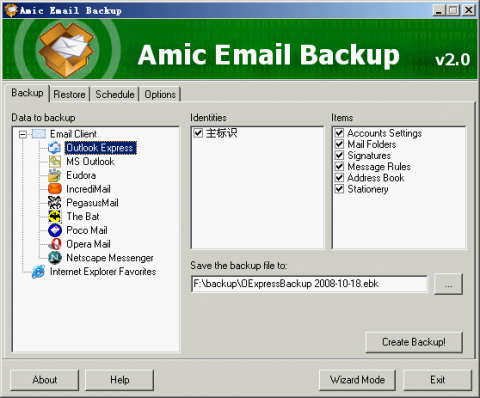 Amic Email Backup can backup the Emails automatically on time. In the "schedule" window, you can set the backup frequency, backup start day and backup time. The interface is very simple and intuitive so I don't want to explain more. The only is that do not forget to enable scheduled backups. Language: You can change the interface into another language. By now, it supports 6 languages: English, French, Italiano, Magyar, Nederland, Russian. Backup Mode: Set how to create multiple backups. Overwrite the last backup file or create a new one. Security: Set a password to the backups so that other people can not restore your backups. 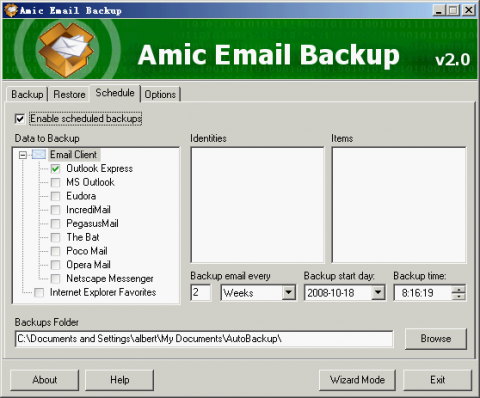 Volumn: If your Emails backup file is very large and want to save it to a removable media, you can set the volumn type. If the backup file size is larger the media's size, it will be splitted into several files. These features can be found in the "Options" window. Amic Email Backup can be downloaded from its home page: www.amictools.com/v-amic_email_backup.html.